The People’s Choice Podcast Awards, better known as the Podcast Awards, is an annual set of awards given to the best Podcasts as voted by the people. The annual Podcast Awards is a chance for your show to be recognized so be sure to inform your audience of the event. 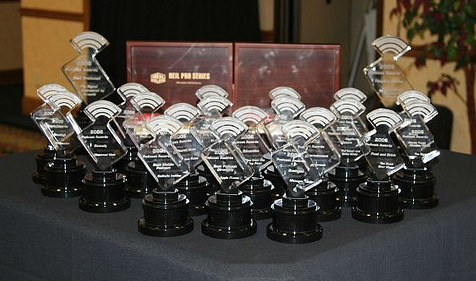 The 9th annual Podcast Awards Ceremony will be Held at New Media Expo in Las Vegas January 2013 with financial incentives to attend for “every” show that receives a nomination. Nominations are open Oct. 1-15. Each category will have an entry form that asks for the name of the podcast, the podcast url, your name, your email address, and nomination comments. The email address must be valid to receive verification on the nomination. Word of warning for your audiences. They can only submit the nomination form once see rules. Once nominations close 44 volunteer listeners will review the nominations, and grade the podcasts that are nominated. The reviewers grade shows on the following. Nominated in an appropriate category. Show established prior to Jan. 1, 2012. Produced more than 10 Episodes. RSS feed icon with enclosures visible on their website. The top 10 nominees in each category will be announced for the final voting slate which will start in November. Visit the PodcastAwards.com website for all the details and latest announcements. Follow the PodcastAwards Twitter account as well.